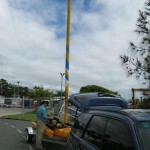 We chose Manly as we had done our sailing course there with the Royal Queensland Yacht Squadron and were familiar with both the harbour and close by. 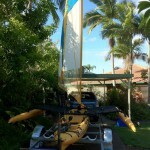 Taking advantage of the Hobie Mirage Drives, we peddaled/paddled out of the mariner and headed south. Helen suggested we should get some serious peddling in to build up stamina in case we ever needed to rely soley on the peddles, so we set a course towards Wellington Point. Surprisingly despite heading into the wind and waves, the 5kms only took us 90mins of mostly walking pace peddling. Along the way we also encountered a few rafts of jelly fish, that you could feel impacting on the turbo fins of the Mirage Drive. 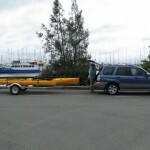 We hauled up onto the sandy spit at Wellington point for a rest and something to eat. One of the problems we’d encountered along the way was that the Hobbie supplied water bottles, while fitting perfectly in the holder are a screw top, and so you run the risk of getting salt water in when drinking. This means we ended up not drinking as much as we should have. Unfortunately the other water bottle holder is too small for a standard drink bottle, so we’ll need to solve that problem later. Mr Henderson, you have the helm! After nearly 90 minutes of paddling (actually peddaling the mirage drives) we decided to unfurl the sail, kick back, & enjoy some sailing! 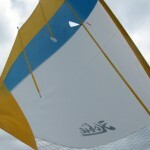 After a short break we unfurled the sail for the first time to see what she could do. 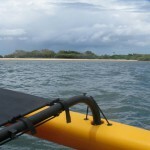 To finish our first trip off, we decided to head over to Green Island before heading back across to Manly. 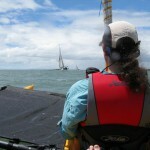 We received a lot of waves and smiles from passing boaties, especially those in much larger sailing boats. Despite some ominous storm clouds we avoided getting rained on and had a terrific first trip. This entry was posted in Trips and tagged Tandem Island, Trip Report. Bookmark the permalink.